Two days every week this fall, Kim Malm ’90 made the hour-long trip from her home in Harleysville, Pa., to Lafayette to be reborn. It didn’t happen overnight. Soon, however, as she sped along the turnpike, visions began rising from her mind like a pond thawing in springtime. Ideas churned. Anticipation built. 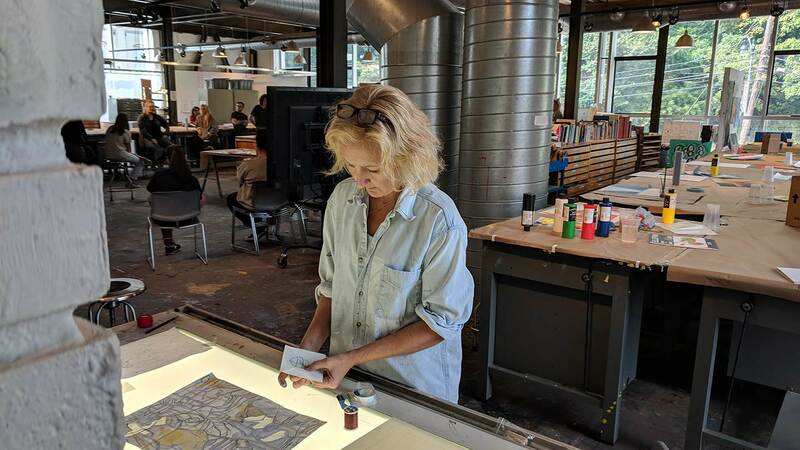 By the time she rolled into the parking lot outside Williams Visual Arts Building and ascended the steps to the big studio on the second floor, where canvases and paints awaited her, Malm felt like an artist again. She had been a painter most of her life, but lately, feeling like one hadn’t been possible. In August 2017, doctors told Malm she had stage three endometrial cancer. For much of the past year, Malm has stumbled through endless passageways of pain —from operations to chemotherapy to radiation therapy. On the other side, she felt further away from her profession than ever. “It stops you in your tracks,” she says. 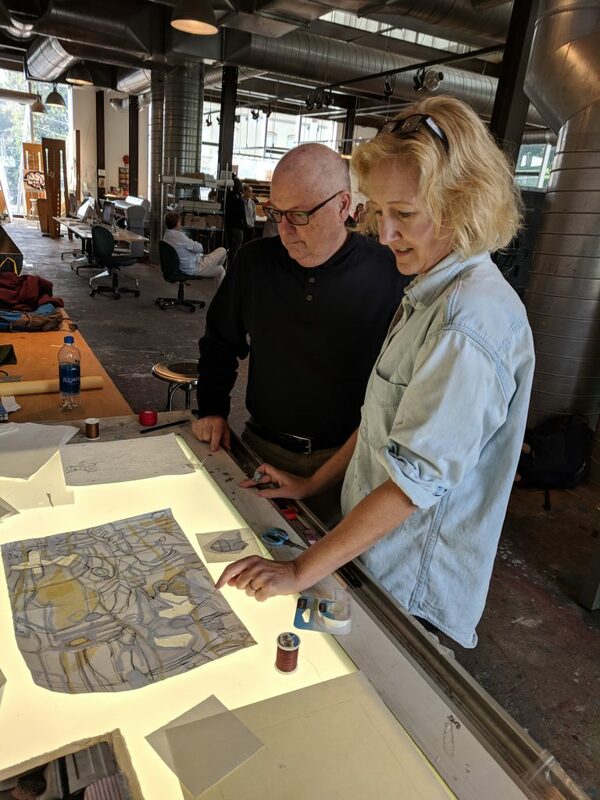 Ed Kerns, Clapp Professor of Art, and her old colleagues at Lafayette have helped Malm return to the profession she loves. 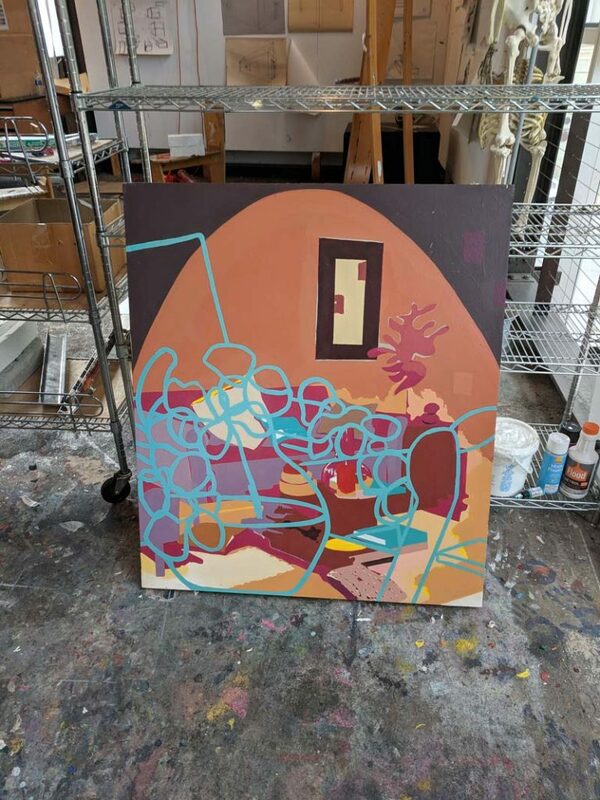 She is painting once again, charged by the creativity of Kerns, Jim Toia, director of the art department’s community-based teaching program, and the art students she surrounds herself with. Malm’s story is a portrait of both the restorative power of art and the depth of Lafayette connections. Students, faculty, and staff form bonds that neither time nor disease can break—the results can be success in the realms of science and industry or less obvious. Lafayette connections can be personal and deeply felt. Malm taught at Lafayette, most recently in 2015. Now she has become a familiar sight in the studio, again. Sometimes she paints on big canvases, looking out at the steps that descend College Hill, thinking of her grandfather who graduated in the 1930s. 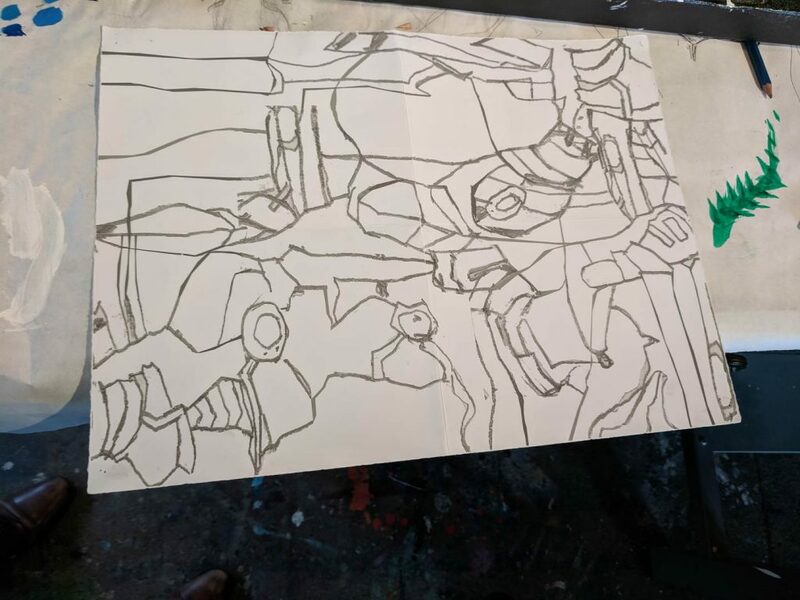 Recently she was leaning over a light table in a corner, stitching thread along drawings she made depicting medieval knights. Malm felt a kinship with Kerns the first time she met him more than 30 years ago. Malm had majored in art and economics (the economics degree had been to placate her parents, she says). Like so many students before and since, she took Kerns’ Introduction to Painting course. Malm was the first of Kerns’ students to go to graduate school; after Lafayette, she obtained an MFA from University of Pennsylvania. The goal, Malm says, was to follow in Kerns’ footsteps, and she returned to teach at Lafayette in 1999. Her art found success, as well. Malm’s work is well-known in Philadelphia, and some has had national exposure, such as her work with noted poet Ross Gay ’96. Pedagogy and painting were inseparable for Malm. “A good moment of teaching is just as blissful as a good painting day,” she says. She was among the first group of professors to work in Williams Visual Art Building, the mammoth, award-winning structure on South Third Street that opened in 2001 and where Kerns works to this day. Malm took time off to be a full-time mother and returned to teaching at different colleges. Then doctors discovered a tumor. After her operation, the diagnosis was that the cancer had spread to a lymph node. “My head was spinning,” she says. She opted for chemotherapy and radiation therapy. The side-effect exhaustion forced her to put down her brush. She emailed Kerns, who immediately invited her to start working on campus again. She reunited with Toia and his use of the natural world on canvas. Kerns’ heady combinations of art, neuroscience, and biology hung on the walls. The energy of the students kicked in. It wasn’t long until ideas started flowing. Malm hasn’t attempted to capture her illness with her art, but its influence is there. Ideas for paintings were few as she endured her therapy, but one vision came to her as she fought the disease. It stayed with her through her recovery. Now, it’s emerging as her latest art project. Metal helmets, visors, and shields. Some things—like art and friendship—are impervious to even the strongest of blows. I wish Kim good health and good art. I was a biology major and took a studio art course my senior year with Ed Kerns. It’s been a long time – I’m a member of the class of ‘85 – but his class was one of my favorites. I’m glad to see he’s still there inspiring.